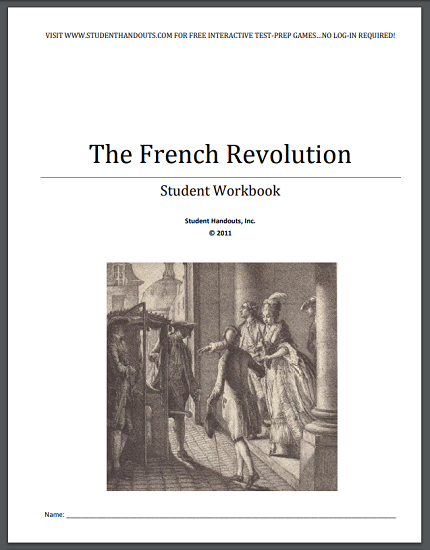 This "French Revolution: World History Student Workbook" is designed for students learning at the junior and senior high school levels. This workbook's 24 pages are packed with informative, easy-to-read text, questions following each section, quizzes in the middle and at the end, and so much more. There are well over a dozen contemporary illustrations. Students are asked to analyze contemporary political cartoons. Questions range from basic recall to critical thinking. There is even a crossword puzzle. 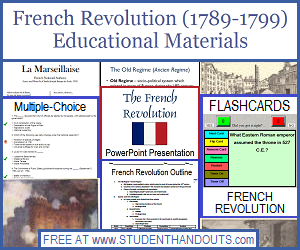 This workbook is designed to appeal to all students studying the French Revolution, whether the student is a struggling reader or operating at the college-prep level. The topic is covered in-depth, well beyond what is offered by standard textbooks. Click here to print.